The cast and crew of THE CURIOUS INCIDENT OF THE DOG IN THE NIGHT-TIME have been hard at work in rehearsal for the past few weeks. 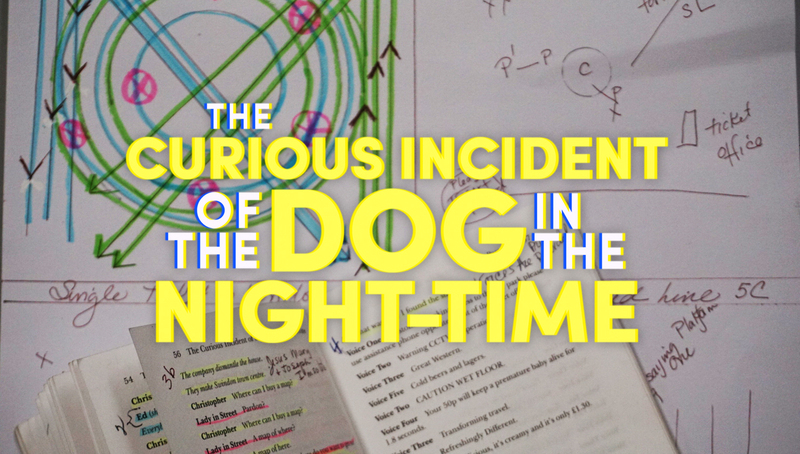 Director Ruth Griffin gave us a look into the process of creating the production for SAC, and the research that goes into forming the world of CURIOUS INCIDENT. Ruth Griffin is a Professor of Dance/Theatre at Fresno State. She is a transdisciplinary performance artist and educator holding degrees in music, dance, creative writing and theatre. Her Certifications include: 1. Practitioner and Teacher of Body/Mind Centering 2. Pilates Instructor. 3. Neutral mask and Corporeal Mime, the London International School of Performing Arts. She has pursued a career as a Physical Actress touring with the Dell’Arte Company and the Theatre of Yugen. She is a Graduate of the Advanced Studies Program at The Dell-Arte International School of Physical Theatre. Among the plays, she has directed are: Tales from Ovid, Passion Play, A Servant to Two Masters, The Dispute, Bronte, The Arabian Nights, The Maids, Samuel Beckett’s Play and Quad, The Bald Soprano and the opera Carmen. What are some of the elements and themes that drew you to this play? Why is it an important story to tell? After seeing the play for the first time it was the movement used in the storytelling that thrilled me. I have always been interested in the cross section of dance and theatre and what I call imaginal realism in theatre, where the body and its interaction with other bodies in the space is subtext. As I have studied the script and the work of the pioneers in the theories and treatment of autism I have been compelled by the traumatic events in development that lead to autism. I sense into the quality of a mind split off from emotion encapsulated by an interiority with the infinite. In this play we are invited to enter this world and participate. Time is nonlinear. The narrative is advanced through a collage of past and present. All characters are being experienced within the consciousness of Christopher. Everything onstage is happening within him. We are dropped into the middle of moments. It is a play of profound intimacies of suffering that freely incorporate many storytelling modalities. I am also drawn to the incorporation in the play of the technique of alienation from Bertolt Brecht. In this technique, the audience is repeatedly made aware that the play is a play. Many people in the area know you for your work with dance and theatre. What’s the importance of movement in this show and how does it help you tell the story? BI employ movement as subtext. In addition, the space is open for the actors to script through body and movement. Movement is another language. Movement languages that I employ are from Viewpoints Post Modern Dance, Classical Noh Drama, Contact Improvisation and Corporeal Mime. The company of actors is all storytelling agents. As I stage the play, I am consciously detailing the company involvement as a chorus similar to Greek drama. I seek to develop within the ensemble a unity of sensation, a shared nervous system. I seek to embolden the script through this embodiment of the actors. You collaborated with “Break the Barriers” during the rehearsal process. What was valuable about this partnership and how did it influence the cast? Kyle Carlson, who is the acrobatic coach for the production, is the Programs Director at Break the Barriers. He has been instructing the cast of Curious Incident about children on the spectrum. Kyle arranged for Jared Serpa, who is playing Christopher, and I to tour the facility of Break the Barriers and observe a class with the children on the spectrum of autism. The class was taught by Aubrey von Berg who is enrolled in the study of children on the spectrum at Cal State Fresno. Deby Hergenrader, the founder and owner of Break the Barriers, joined us after the class and spoke to us about the programs at Break the Barriers for children on the spectrum and the trainings that her staff engage in regarding these and other special needs children. Break the Barriers is an Oasis for these children and their families. What do you think the audience will walk away with after watching this show? As a director, I am always dreaming into the unconscious participation of the audience. I want to foster a connection between all the performers and all the stage elements for the co-imagining of the narrative by audience. I am intent to constellate a field that the unconsciousness of the audience inhabits and by so doing completes the play. So, in walking away after watching the play I wish for the audience to feel enlivened by their own ability to imagine and to feel.